I love Game of Thrones. I got hooked on the show and picked up the books halfway through - finally, so many of my friends' Fantasy Flight commissions made more sense! 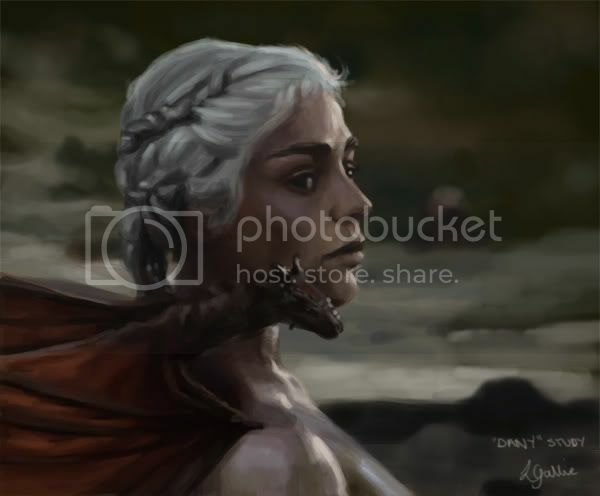 This shot of Danaerys Targaryen from the series finale grabbed me so hard I just HAD to make a study of it. The lighting, the composition, Dany's expression and the adorable Drogon. There just wasn't anything else for it. Just a quickie - about two hours in Photoshop CS2. I made it an exercise in seeing colour and didn't let my pen touch the eyedropper. I'm working on a book cover right now, which I can't show until it's been approved. Soon, though! In the meantime, I've started a Tumblr after mulling over it for ages and stalking certain blogs. It's not strictly an art blog. I love the scrapbook quality of it and so you can expect to be subjected to a wide variety of my interests - crafts, interior design, fashion, far away places, fun photos, sappy inspiration quotes and the occasional fitness article. I will post WIPs and sketches too, but the majority of it will be things that inspire me rather than things I make myself. If that doesn't put you off, see you over there!